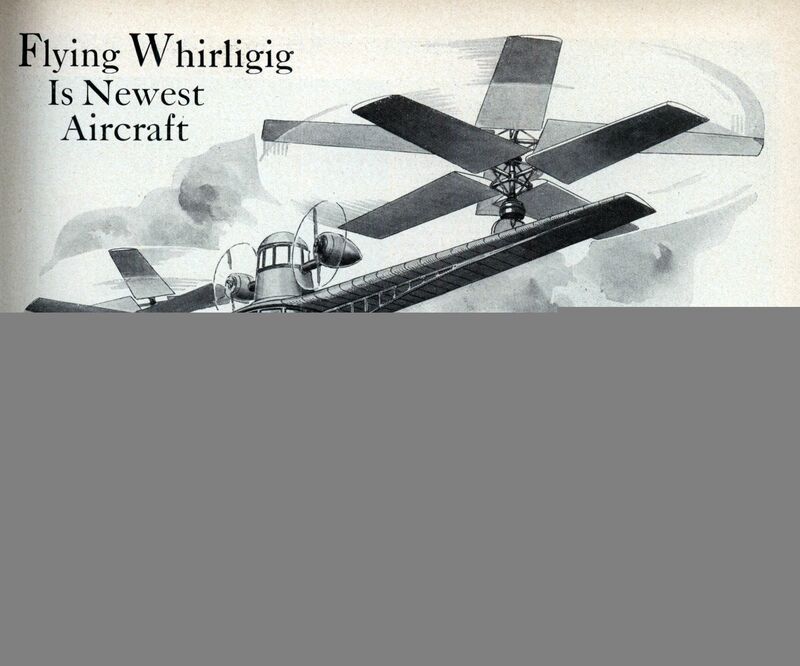 A “FLYING WHIRLIGIG” combining the principles of the standard airplane, the autogiro, and the helicopter, is envisioned by a Glenn Dale, Md., inventor, just granted a patent. His design calls for a main wing of conventional form, having at each extremity a set of windmill-like vanes, or “booster-copters, ” arranged to rotate freely when the craft is in motion; their lift aids the main wing to support the machine. The two rotors of each set revolve in opposite directions. Twin propellers, flanking an elevated “pilot house, ” constitute its power plant. They swing upward to provide additional lifting force during the takeoff, and return to horizontal position for forward flight. The inventor foresees the construction of huge air liners which could leave the ground or alight in congested areas where space is limited. Did some searching for the patent that’s referred to in the article, and found that Glenn Dale was actually granted two : US1981441 (for the whirligig/airplane design) and US1981442 (which was for a pure helicopter). Both patents were issued on the same day, hence the sequential numbering. 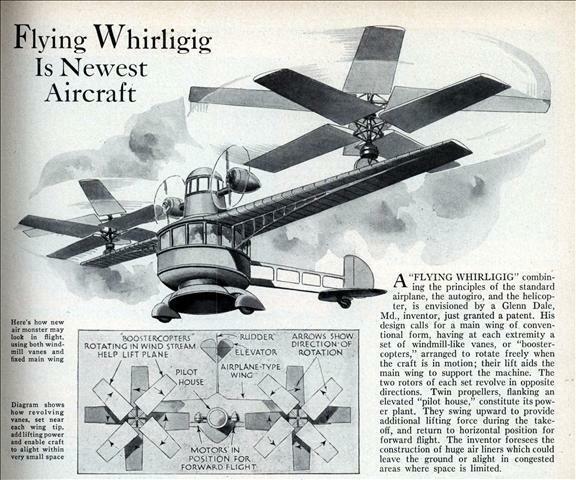 If you think the whirlygig design is strange, just wait til you see the drawings for the helicopter – it has 16 sets of rotors, 64 blades all up! as depicted on the screen with Vincent Price? The movie “Master of the World” was based on the Jules Verne novel “Robur the Conquerer”, with the exception of the character of Strock. In the novel “Master of the World” Robur returns with a combination airplane, boat, automobile called the ‘Terror’. JMylnt; I had that in ‘Classic Comics’ format. vehicle on the dirt roads of the late Nineteenth century. 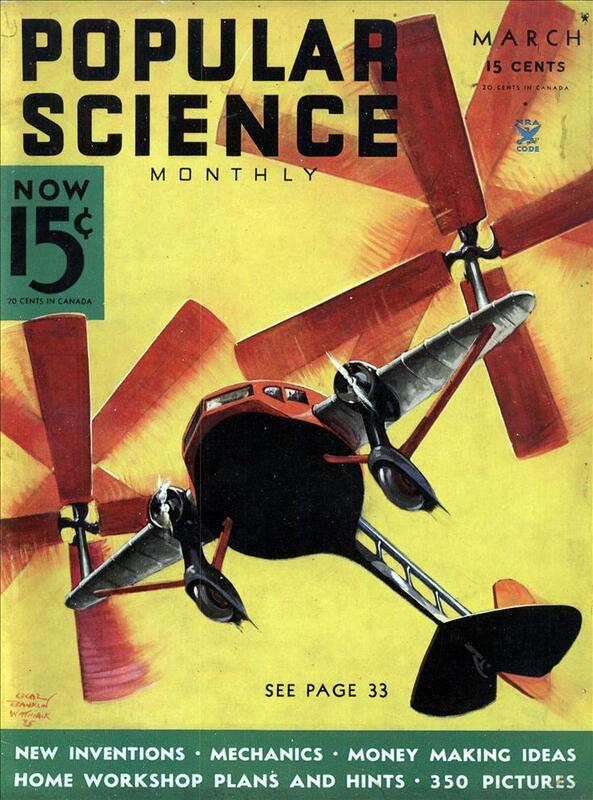 the reason many helicopter designs failed was because many of the inventors thought of the blades as wings, and would be shaped like so. the problem was that the blades where often too heavy to move quickly, and the control surfaces where never worked out, or sometimes nonexistent. Charlie, the big picture is broken. Also can I suggest, that the “Recent Comments” column have more entries? Now there’s only 5, and I’m sure, that I’ll miss some interesting ones…. Jari, I’ll look into the picture. I have added a link to the comments RSS feed right below the Recent Comments box. If you subscribe to that you should be able to see them all.